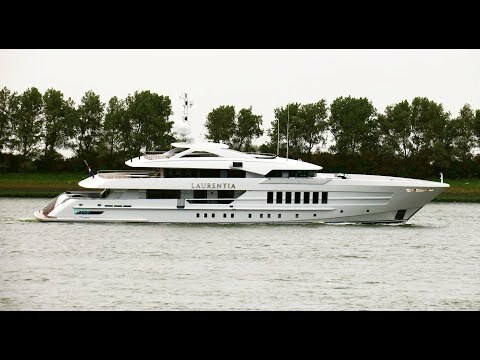 Dutch yard Heesen has released a behind the scenes video on board its 55 metre steel-hulled superyacht Laurentia. The video is set against the backdrop of St Lucia and includes a tour of the yacht's beach club and 1,400 litre swimjet pool. Viewers are also treated to a tour of the 100 square metre sun deck and huge sun pad, as well as the main and upper deck entertaining spaces. 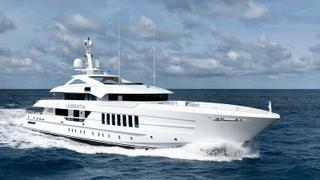 It comes after the yacht was secretly launched in July last year, as exclusively revealed by Boat International. Formerly known as Project Alida, she achieved a top speed of 16.6 knots on sea trials. Built on speculation, Laurentia features clean, muscular exterior lines by Frank Laupman of Omega Architects. One notable feature of the exterior styling is the original “shark tooth” design detail of the wheelhouse overhang. Omega put a priority on indoor-outdoor living and the yacht features glass inserts in the bulwarks and 180-degree floor to ceiling windows in the 102 square metre skylounge so full views can be enjoyed from anywhere on board. 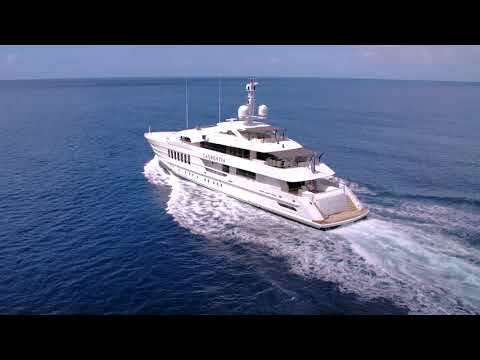 The accommodation stretches out across her 740GT interior, allowing for up to 12 guests in six staterooms. She has a main-deck master suite and five staterooms below decks, including a one full-beam aft VIP, two twin cabins and two double cabins, all of which feature en-suite bathroom facilities. Miami-based design firm Radyca was brought in to design the interiors, which convey a relaxed lifestyle throughout the yacht. Ramon Alonso, lead designer at the studio said: “The objective was to create a clean and simple, yet sophisticated interior that evokes tranquillity in a relaxed and elegant atmosphere." This was achieved through widespread use of natural hues and materials such as open-grain white oak, dark wenge wood, different tones of taupe and grey leathers, white Arabescato and brown Grecale marble, wool carpets and light textured suedes. Outside spaces are generous as well, with a sundeck complete with spa pool. Laurentia’s tenders are launched from the foredeck, leaving the transom free for a spacious superyacht beach club. In terms of naval architecture, she rides on a Fast Displacement Hull Form designed by Van Oossanen, which ensures she will be frugal on fuel and have a range of 4,500 nautical miles at 13 knots, or cruise at 15 knots powered by Twin MTU 8V 4000 M63 diesel engines. Other superyacht projects currently under development at the Dutch yard include the 55 metre Project Antares, which is due to be delivered in November.